Here at F Smith & Son, our priority is to offer a quality, reliable and personal service to all of our clients. With our storage service, your goods are only handled twice when moving into our store (1) Out of the current property, into the containers (2) Out of the containers, into the new property. The containers are forklifted onto and off the removal vehicle. It is advisable for clients who are requiring short or long term storage, to contact our office and arrange for an estimator to call on you at a mutually convenient time. 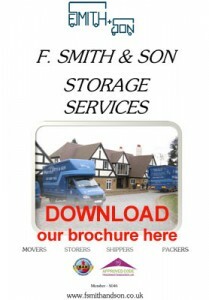 We at F Smith & Son have been trading for over 75 years, giving us the wealth of knowledge that is required for a successful and professional removals company. We have been refining our removal techniques through experience, training and the use of modern equipment to enable us to meet the high standards that we set. We provide free removal quotations within the Greater London, Surrey and Kent areas, giving you the chance to meet our representative and get a feel for how we operate. This survey allows us time to evaluate all of your requirements and generate an accurate quotation. We understand that it is not always possible for clients to be available for us to call on them. This is why we have the option for you to receive an Estimate simply by completing our online inventory. However we must bring to your attention that it is very difficult for removals to be correctly gauged by submission of an online form or by phone. We advise that you be as accurate as you can when completing this inventory and only use this as a guide when budgeting or comparing prices.